For applications demanding low power and longer battery life, the PIC32MM has sleep modes down to 500 nA. Applications with space constraints will benefit from the small 4x4mm package options. The PIC32MM devices include core independent peripherals, designed to offload the CPU for lower power and flexible system design, such as Configurable Logic Cells (CLC) and Multiple-output Capture Compare PWMs (MCCPs) which help enable sensorless BLDC motor control applications. 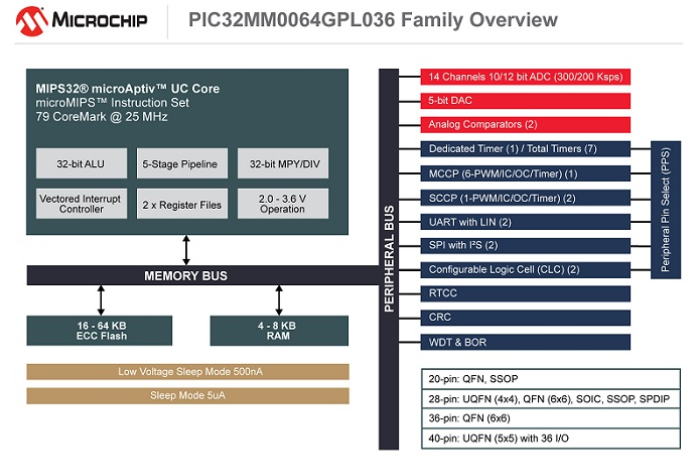 PIC32MM devices achieve a 79 CoreMark score at 25MHz operation, featuring the compact microMIPS™ instructions, microAptiv™ UC core, and a shadow register set for fast interrupt context switching. The microMIPS ISA combines 16-bit and 32-bit instructions for compact code size. The PIC32MM devices are supported by the Microchip MPLAB® Code Configurator (MCC) to help simplify designs.